Reform in Brazilian football: where to begin? The bomb has gone off and any illusions about the strength of Brazilian football have been obliterated. As the dust settles after Brazil’s 7-1 loss to Germany, there appears to be a consensus around the country’s football fans: something needs to change. The federal government has made its stance clear, committing to actively instigate reform throughout the national game, proposing new laws and regulations and promising to put pressure on the Brazilian FA (CBF) and heads of the country’s big clubs and state federations. A complete clear-out of the CBF, something many have called for, is out of the question. Fifa law forbids government involvement in the operation of national football federations and we have just seen the Nigerian FA suspended for that very reason. What is happening is the proposal of a new set of laws to tackle the obscene debts of Brazil’s major clubs, something approaching Fifa’s Financial Fair Play ruling, which will soon be voted upon in the Chamber of Deputies. The Law of Fiscal Responsibility in Sport (not as catchy as FFP) proposes the refinancing of clubs’ debts over the next 25 years (in 2013, Flamengo’s debt reached R$ 750,7 million, 11 times the tax bill that saw Rangers put out of business in Scotland), but only if they follow regulations regarding good business practice and responsible spending. Sanctions would be handed out to those who do not comply, including financial penalties or sporting punishments such as point deductions and demotions. Its aim is to have better run clubs in Brazil and avoid the widespread reports of unpaid salaries we have seen for the past ten years and beyond. Of course, this is a noble initiative, although I would like to have seen more incentives put in place for clubs to develop infrastructure, youth development schemes and programs to benefit supporters attending the stadium. Another point of contention is the premature exit of young Brazilian footballers to leagues overseas, which President Dilma Rousseff has addressed herself, saying Brazil is “letting go of [its] main attraction”. Although Brazil’s citizens go to the polls in October to decide whether or not Rousseff gets a second term in office, these actions do not seem to be typical electioneering. Claims that football has the power to influence the Brazilian political system are false and insulting to many people here, who rightly point out Brazil is about much more than just its national football team. Of course, outside of the political sphere, the success of the Seleção is an important issue, considering it is a great asset to the country, a brand recognised and loved around the world. Forming a strong national football team is a group effort, requiring people at all levels to pull in the same direction. Problems have been growing for some time, but Brazil have often been able to fall back on their immense pool of natural footballing talent to pull them through in difficult situations. You can imagine a strong German team without Thomas Müller, Manuel Neuer or Toni Kroos, but a Brazilian side without Thiago Silva or Neymar? An important contributing factor is the weakness of Brazilian domestic football. The league has adopted an export model for some time, grooming young players and selling them to Europe for transfer fees that keep domestic clubs afloat, but this has reached a critical mass and the results are evident on the field. When Brazil won the World Cup in 2002, 13 of their squad played for clubs at home. This year, only four were Brazil-based: reserve goalkeepers Jefferson and Victor, and centre-forwards Fred and Jô, widely regarded as the team’s weak links. Having players based at home is no guarantee of international success (just ask England and Russia, who crashed out in the group stages after selecting exclusively home-based squads), but it certainly helps and reflects the strength of a nation’s footballers. Only once in the history of the sport has the World Cup been won by a squad who had a majority of foreign-based players: France in 1998. Argentina could become another exception to that rule, but they have been able to count on the best player in the world, possibly the greatest of his generation, Lionel Messi. The reasons for this exodus of young Brazilian talent are numerous, and they go beyond the national league’s model of exporting players. First of all, conditions for youth team players are woeful at many of the country’s big clubs, with no support given to the starry-eyed teenagers living hundreds of miles away from their families in housing that looks more like the workhouses seen in Georgian Great Britain. Then, when these players become professionals, they have to face a whole host of new problems, from the aforementioned instances of delayed or unpaid wages to the crazy calendar of Brazil’s domestic leagues. Players at big clubs are forced to play all-year-round, twice or three times a week and often on poor and dangerous pitches, while those at smaller clubs may only have matches for two months of the entire year. The quality of football in Brazil’s top division has improved over the last few years, but this is largely down to clubs signing expensive foreign talent, making Argentinians Andres D’Alessandro and Dário Conca and Chileans Charles Aránguiz and Jorge Valdivia among the league’s main attractions, instead of developing Brazilians. Players are leaving Brazil at younger ages: a quick glance through the Under 19, 17 or even Under 15 Brazil squads will show the majority of them already playing for European clubs. Since the turn of the century, stars of Brazilian football such as Ronaldo, Rivaldo, Ronaldinho Gaúcho and Kaká all developed into magnificent players while playing in Europe, but they all made a significant impact at a Brazilian club before leaving. This current Brazil squad has players such as David Luiz, Dante, Luiz Gustavo, Fernandinho and Hulk, who didn’t stay at home long enough to make a name for themselves and instead came to the attention of the Brazilian public when starring at top European clubs. Paulinho and Neymar are exceptions, but even then Neymar left for Barcelona at 21 years of age, while Paulinho had already left Brazil to play in Poland and Lithuania before returning and getting his break at Corinthians. It would be difficult to blame the players themselves for this trend. Considering the conditions offered to footballers in Brazil, when the opportunity comes to go abroad it is often too hard to refuse. We had two good examples of this in recent years with former Fluminense forward Wellington Nem and ex-Botafogo winger Vitinho. Nem had been an important part of Fluminense’s youth setup, being groomed for a first-team place from a young age, working through the youth ranks and having an impressive loan spell at southern club Figueirense. He was an important part of the Fluminense side that won the 2012 Brazilian championship and was even knocking on the door for a call-up to the national team. In June of 2013, Ukrainian side Shakhtar Donetsk came knocking with a transfer offer of €9 million. The player was hesitant to leave, he was playing well at home and still had plenty of developing to do, but he was under so much pressure from his family, his agent and his club, who were in a dire financial situation at the time. Fluminense told him in no uncertain terms that they wanted the money and Nem was forced to go to Donetsk, where he played only five times last season. Vitinho’s rise to fame came so quickly, bursting on to the scene at Botafogo under the wing of Dutch veteran Clarence Seedorf. In the space of a few months he had gone from an unknown youth product to the team’s most important player. But before Botafogo fans could make him an idol, he was already on his way to Europe. Half-way through his first season as a professional, Russian side CSKA Moscow snapped him up for €9.5 million. Again, it is difficult to blame the player. Vitinho’s wife had just given birth to their first child and Botafogo had failed to pay him his previous month’s wages. CSKA arrived with money on the table, and not knowing if he would ever get the chance again, he accepted. The future of Brazilian football may well lie in the hands of Bom Senso FC, a group formed by players to fight for better conditions throughout the game in Brazil. They have delivered their demands, they have met with influential figures and they have even staged protests on the pitch. Only a couple of days after the World Cup final, the Brazilian championship will restart with a full card of midweek fixtures. Now is the time for the leaders of Bom Senso to act, the eyes of the world are still on Brazil, the shouts of gol da Alemanha! still ringing in their ears, the government is behind them and they can count on another influential member with the return of Kaká to São Paulo FC. Now is the time for change. 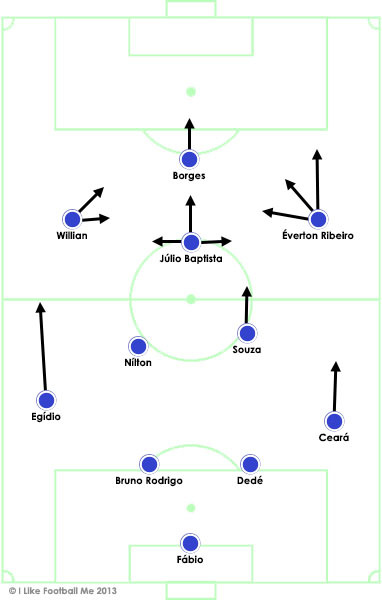 Posted on July 11, 2014 Categories OpinionTags Bom Senso FC, Brasileirão, Brazil, CBF, Dilma Rousseff, Seleção, Vitinho, Wellington Nem2 Comments on Reform in Brazilian football: where to begin?